Vice Admiral Viscount Nelson of the Nile and Burnham Thorpe KB, RN. Fought on the 21st. October 1805, effectively ended the war at sea. 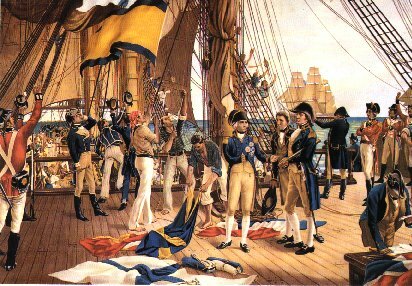 Lord Nelson died at about 4.30pm. by which time he knew that he had achieved the overwhelming victory that he had planned so carefully. Nelson had left nothing to chance. The two-column, right-angled attack worked exactly as he had intended by splitting the enemy fleet into smaller groups that immediately fell prey to the guns of the British fleet.